In awe over break-the-fast rugelach. People rhapsodize about s’mores and write odes to chocolate chip cookies. But come Jewish holiday time and what dessert wins the day? 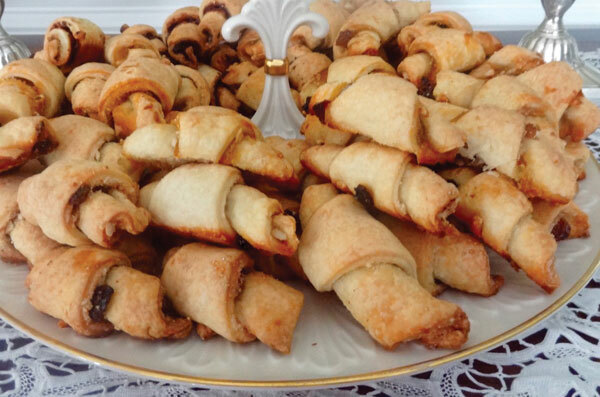 Rugelach — the pastry once familiar mainly to Ashkenazi Jews but now ubiquitous throughout the land. 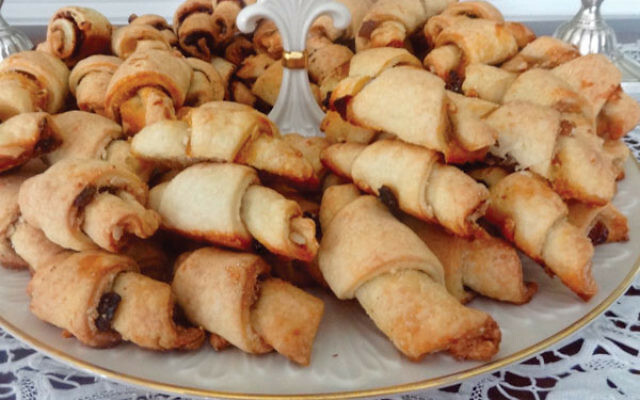 Rugelach — butter-rich, sugar-dense, flaky-crumbly crescent cookies. Stuffed with jam and raisins. Fragrant with cinnamon and nuts. And sometimes with a swirl of chocolate. I defy anyone to say no to them. Well, folks, I am grandma. I have a good recipe. I make this recipe every year for Rosh Hashana and by Yom Kippur they’re already gone, so for the last several years I’ve doubled up on the first batch and hide some in my secret place in the freezer. Otherwise I have to make more so we can have some at my annual break-the-fast. In days gone by — like when my grandma baked — rugelach were made from yeast dough. The benefit was that the dough was parve and therefore more versatile. But dairy-based rugelach like mine have become more popular over the years because they are so fabulously rich and flaky and they have a salt-like tang that goes perfectly with the sweet fillings. They are also much easier to prepare. Of course if you need a non-dairy version you can use substitutes such as tofutti. You have to plan ahead when making rugelach because the dough must be cold in order to roll it properly. Wrap it well and it keeps, refrigerated, for several days. I’ve even frozen unbaked dough for as long as two months. Classic rugelach are crescent shaped: Roll sections of the dough into circles, spread the surface with filling, cut the circle into wedges, and roll each wedge starting with the widest side. There’s an easier way to shape them though: Roll each dough section into a circle, spread with filling, roll the dough jelly-roll-style, and slice into bite-size pieces. They taste exactly the same. I usually stuff rugelach with some combination of jam, cinnamon, and raisins. But there’s no magic formula. Use what you like: chopped nuts, shaved chocolate, candied cherries, crystallized ginger, dried cranberries, orange peel, halvah, toffee chips. I bake them plain, but if you like fancier, brush the tops with beaten egg and sprinkle with crystal sugar and/or finely chopped nuts. Beat butter and cream cheese together in a mixer at medium speed until smooth and uniform, about 2-3 minutes. Add flour and salt, blend them in slightly, but not completely. Add sour cream and mix until a soft, smooth, uniform dough has formed. Cut the dough into six equal pieces. Wrap each piece and refrigerate 5-6 hours or until thoroughly firm and cold. Preheat the oven to 375 degrees. Roll each piece of dough on a lightly floured surface about a quarter-inch thick. Spread equal amounts of filling on top. Cut each circle into eight-10 wedges. Roll wedges from the wide to the pointy end. Curve slightly to form a crescent. Tuck in the pointy end so it is on the bottom. Place the crescents on an ungreased cookie sheet. If they feel soft, refrigerate them for 30 minutes before baking. Bake for about 30 minutes or until lightly browned. Makes 48-60. Melt butter and set it aside. Mix the sugar and cinnamon together and set aside. Spread equal amounts of the melted butter on each of the dough circles then sprinkle each circle with equal amounts of the cinnamon sugar, raisins and nuts. Cut and roll. Melt the butter and set it aside. Spread equal amounts of the melted butter on each of the dough circles then sprinkle each circle with equal amounts of the chocolate, raisins, and nuts. Sprinkle with cinnamon-sugar if desired. Cut and roll. Melt the butter and set it aside. Spread equal amounts of the melted butter on each of the dough circles then spread equal amounts of the jam on top. Sprinkle each circle with equal amounts of the chocolate and nuts, if used. Cut and roll.